SSR has extensive experience in intermodal freight haulage, providing this service for customers with unique shipping and export requirements. Whether we are providing time and/or environmentally sensitive services, SSR handles every intermodal freight job with precision. Intermodal freight gives customers the option of finding the most cost-effective and efficient means of moving their materials and the team at SSR has the industry knowledge and experience to find the perfect solution to your needs. 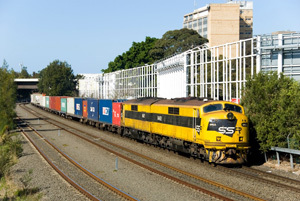 SSR operates an intermodal freight service for exports though Port Botany. SSR maintains Interface Agreements with both Patrick and DP World at Port Botany, and has the ability to source container solutions for customers from MCS at Cooks River, Sydney. SSR train crews are issued with Maritime Security Identification Cards (MSIC) for port access, and are trained in dangerous goods handling. When you are looking for the most efficient means of moving your goods, SSR has the solution for you. Our team of experts can design the perfect intermodal freight system to get your materials delivered on time and within your budget. Get in touch with us today for more information.